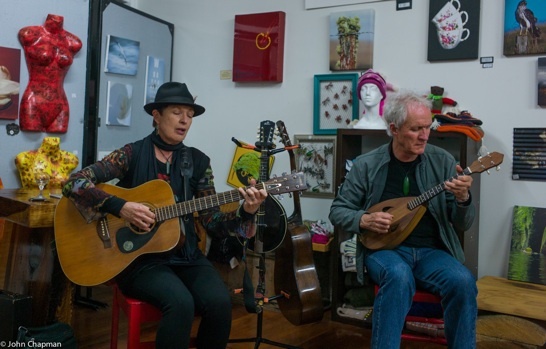 As many of you know, we’ve been touring all over New Zealand (and elsewhere) for 30 years now, and during that time some of our favourite gigs have been intimate, cozy concerts put on in people’s homes – House Concerts. We’d love to do more house concerts, and thought we’d ask our friends whether you, or anyone you know, might be keen to have us do an evening of live music & poetry at your place? House concerts are low-stress to organize. All you need is a living room that can fit up to 20 people (or more if you like). Our hosts usually ask attendees to bring a plate for supper, and maybe something to drink. We don’t use a PA system, so no need to worry about annoying the neighbours! We don’t ask for a set fee, but suggest a door price of between $10-20, depending on how well-heeled your community is, or what you feel your friends/neighbours would be willing to pay, so hosts don’t have to worry about the money side of things. We can provide a flyer template or printed flyers for you to give out, and if you use email we’ve got info you can send as an invitation. Word of mouth seems to be the most efficient way to spread the news – relationships are at the heart of what house concerts are all about. "Mark and Brenda are artists who come from the heart. Their music speaks a universal language that seems to touch every audience they play to. The atmosphere they create is intimate, warm, playful and rich with meaning and a wise knowing of shared experience that baths their audience with a sense of belonging." If you’d like to have us do a house concert, please contact us. We're happy to go wherever you are, whenever you'd want us, if we possibly can.